With a year’s family camping experience under our belt now we’ve learnt quite a bit about what sorts of things we should take with us on camping trips. Everything from a dust pan and brush to washing pegs. 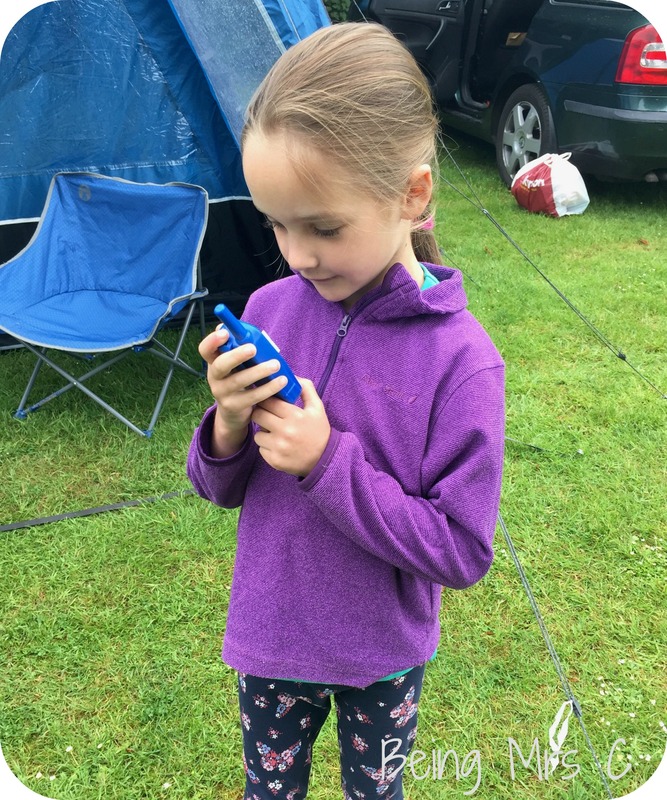 We’ve also learnt a fair bit about camping with children and in particular how the kids want to go and explore as much of the campsite as possible, yet it can at times be a bit hard to keep tabs on where they are, especially if on a large campsite. What we had spotted was lots of children having walkie talkies, either to talk to each other, or for their parents to be able to summon them back to their tent for meals or bed. 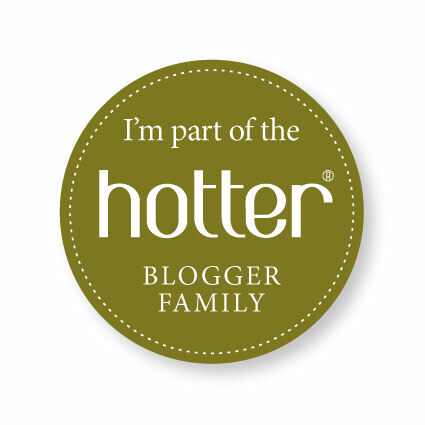 We’d talked about possibly getting some, but then when I saw some on a stand at the recent Blog On conference I realised that our Spring Bank Holiday camping trip (more on that in a post very soon!) was a perfect opportunity to put a set to the test. So that’s exactly what I’ve done with the Discovery Kids Digital Walkie Talkies. One thing I instantly liked about these Walkie Talkies is that they are designed for kids meaning that they’re not too big for little hands to carry and use, and they’re also quite lightweight. They are made of pretty robust plastic, which is vital when being used on somewhere like a campsite where children have a knack of getting involved in a bit of rough and tumble and attracting so much dirt! 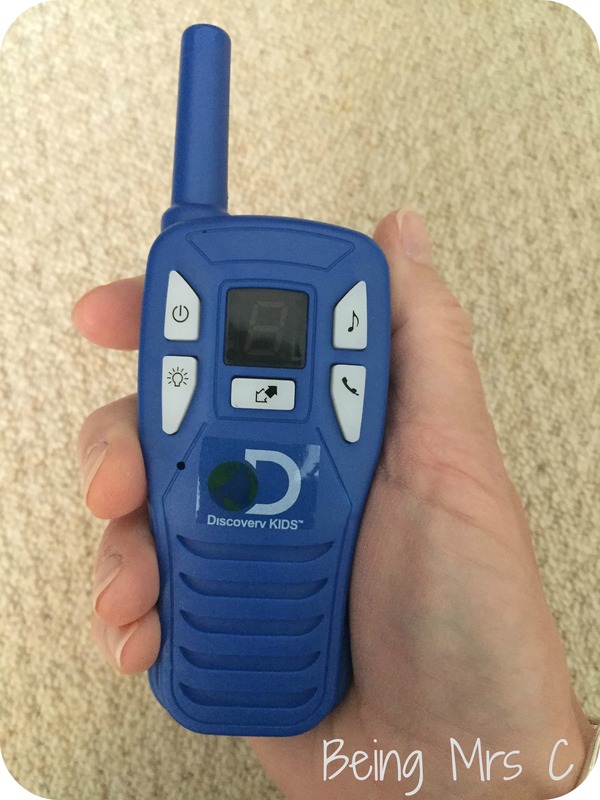 These Discovery Kids Digital Walkie Talkies are relatively simple to use, but do work on 3 channels. The large clear LED screen on the front shows which channel is selected at the time. They operate with a simple push to talk button, but I would suggest that this could be in a better position ergonomically. I’ve always known walkie talkies where it is positioned under your thumb, so it seemed strange to me that it was on the front panel instead. In terms of other features they have a “call” button which can be used to call the other walkie talkie to let them know that they are about to talk. There is also a torch feature which my kids thought was fantastic when testing them out at night-time in their bedrooms before their camping trip. As parents we found the call feature rather loud and annoying, but the kids seemed to like being able to call each other on them like that. The Walkie Talkies have a range of 3km which is plenty to cover any campsite that I’ve been on. I also imagine it’s further than you’d want your kids to roam from your house before they’re of an age when they could have a mobile phone instead. The campsite we stayed on last week was relatively small, but I was still impressed at how well they worked across the site and the digital quality is far better than the analogue walkie talkies I remember from my childhood. 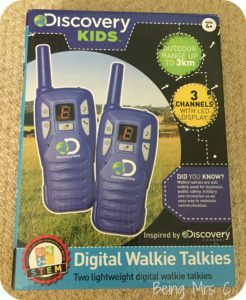 The Discovery Kids Digital Walkie Talkies will definitely be coming with us on future camping trips, but before then I need to just work out how to stop the four year old from planting one on my desk whilst I work and then taking the other one downstairs with him and shouting orders at me via it! Kids eh? Disclaimer: We were given these Discovery Kids Digital Walkie Talkies for the purposes of this review. All opinions remain my own. This post contains affiliate links. I would never have thought about taking walkie talkies on a camping trip but that is such a great idea. OMG what an amazing idea. Sounds so much fun and tbh even when they are old enough for a mobile there’s not always signal. 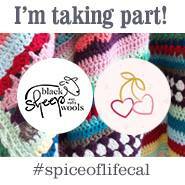 I am off camping this weekend and shall see if we can get some before we go. We used to have analogue walkie talkies when the kids first started exploring the local woods.I think it’s a kid’s rite of passage to own a pair, digital ones certainly sound a brilliant idea. Oh wow, we could do with these for our mobile home in Thanet. I am constantly having to run around the parks searching for them at meal times. Excellent idea.